[top, left]: I painted the inside of the pendant blank with craft paint and put a bird on it. I added Dimensional Magic to set this all in, and set this aside to dry. 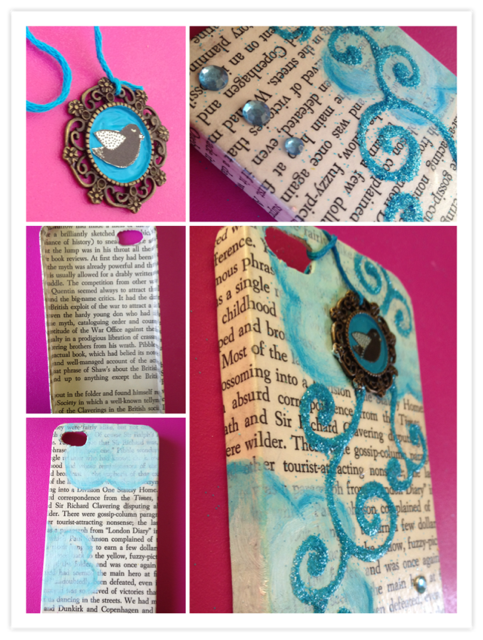 [left, middle/bottom]: Cut out some book pages and basically matte mod podge’d them to death on a clear iPhone case. If you do this with a clear case, you can podge the pages on to either the front or back depending on how you want it to look (both views are shown.) I chose to do the front because I wanted to paint some clouds to go with my bird. [top, right]: I secured my bird towards the top and painted swirls with the Dimensional Magic; quickly, I added glitter and blew away the excess (I don’t recommend tapping/turning because the Dimensional Magic can lose its shape/design.) Of course I added some matching bling as well. *Note: I later re-coated the glitter part with more Dimensional Magic to keep it from chipping. If you use this glaze/glitter combo, I highly recommend doing the same to keep the glitter on. [bottom, right]: Completed whimsical little bird case! Don’t know how well these would sell, but definitely keeping it for my own use. Plus it’s an easy case upcycle for your own phone if you have some glitter handy, because it’s mostly just a bunch of stuff happily coexisting in one space for no reason other than they’re all the same color. Yay!